Butter Chicken Masala is an Indian Dish originated from Punjab which is popular all over the world. Its rich, delicious, creamy and the most flavorful dish. 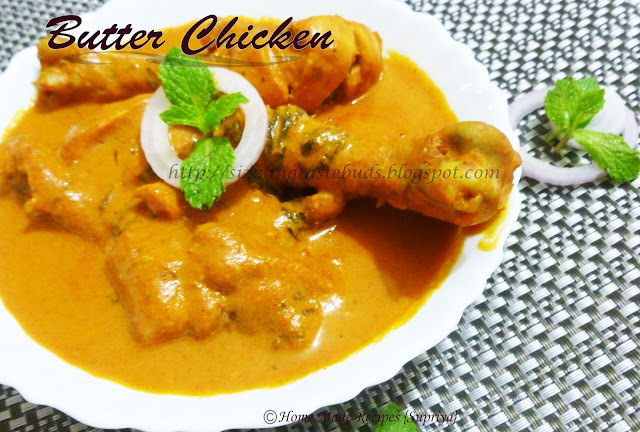 Butter Chicken Masala tastes great with Indian breads like Naan, Tandoori Roti, Chapati etc. I met one of the sweet couple from Netherlands and they said they had this Butter Chicken Masala every alternate days for months during their stay in Bangalore. And there is hardly any restaurant without this famous dish in their menu card. 1. Make some incisions on the chicken leg pieces with a sharp knife and set aside. 3. Heat 1 tbsp of butter + 2 tsp of oil in a cooking vessel. Add the chicken pieces along with the masala paste , chopped pudina leaves and mix well. Pour 3/4 to 1 cup of water depending on how much gravy consistency you want. Mix again and cover the vessel with a lid .Let it cook for 10 mins in a low to medium heat or till the chicken is done and the gravy gets thicken. 4. Now add 1 tbsp of butter to the dish and sprinkle some kasuri methi. Mix well and switch off the flame. 5. Serve hot with any Indian Bread or even with hot steamed rice. Note: Restaurants add tandoori chicken pieces to the dish. 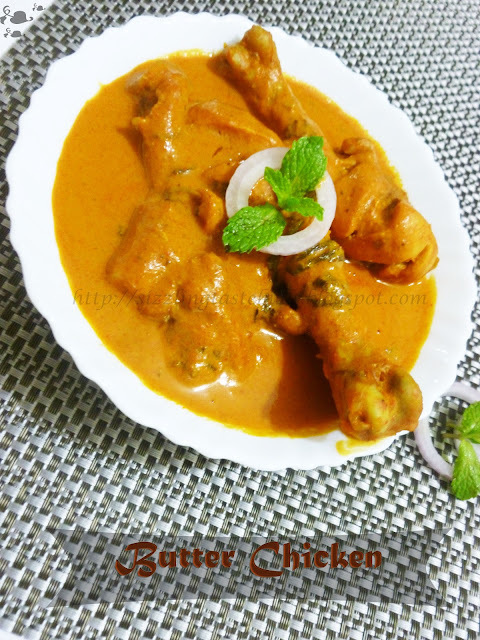 Try this out and you will definitely enjoy with the most easiest butter chicken version.